Exceptional quality, unrivalled attention to detail, positive environmental impact: if these are the values that you want to imbue your business with, then a reclaimed wood boardroom table is the choice for you. Whether you wish to impress a new client or unite the team behind your company’s ideals, reclaimed wood is perfect for an organisation seeking a centrepiece that is truly standalone, unique, and tells a fascinating story. There’s no need to worry about splinters or nails ruining anyone’s suit. 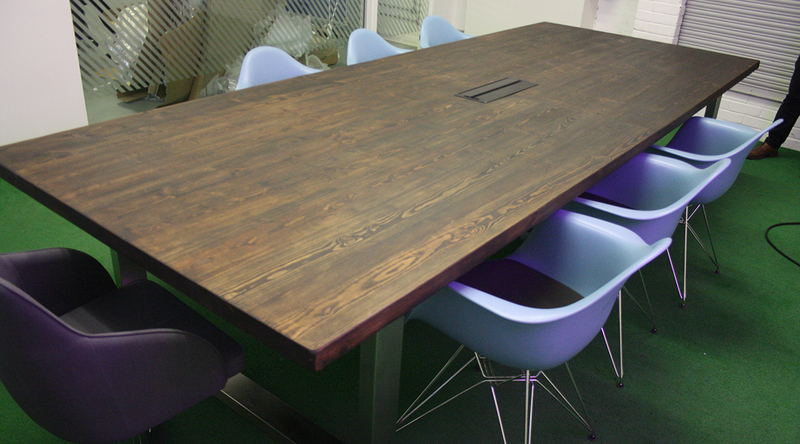 Our reclaimed wood boardroom tables are lovingly finished to ensure complete safety and cleanliness. They are incredibly strong, able to withstand many years of punishment without ever requiring repair and clean up with the minimum amount of fuss. Much like your company and its goals for the future, our reclaimed wood boardroom tables are built on the past but remain focused on the future. Solid, elegant and built to whatever specifications you desire, you will have absolute control over the design and form of your reclaimed wood boardroom table. However, there is one aspect that will always remain mysterious: the unique story of the reclaimed wood. Where did it come from? What was it before? Was it part of an old house years ago, or did it serve as the wooden floor in a historic building? This is the true thrill of reclaimed wood that few materials can rival. Since rescuing it from the fire, we give our reclaimed wood a new purpose, an extension of life that contributes to a sustainable future for your business. The recycled timber has been allowed to mature slowly, resulting in a typically larger and more durable wood, available in four different shades and complete with beautiful imperfections that can only be created through the passing of time. This object from the past will give a clear account of your business’ future to your employees, interviewees and potential clients. You know the value of history, you have heritage and you have an irreplaceable foundation for tomorrow. You might not think a table could convey so much, but your reclaimed wood boardroom table is about to become the new-old heart of your business. Prepare to think again.